Yep, that's Ree, aka, THE PIONEER WOMAN, holding a card she signed for me! ME!!!!! Yay! Awesome!!! I love the Pioneer Woman's website/recipes!!! And the taiko drums were so cool too. I'd love to do that. What's a month? Mine is gone for the next month, but he's in your neck of the woods. Very cool! 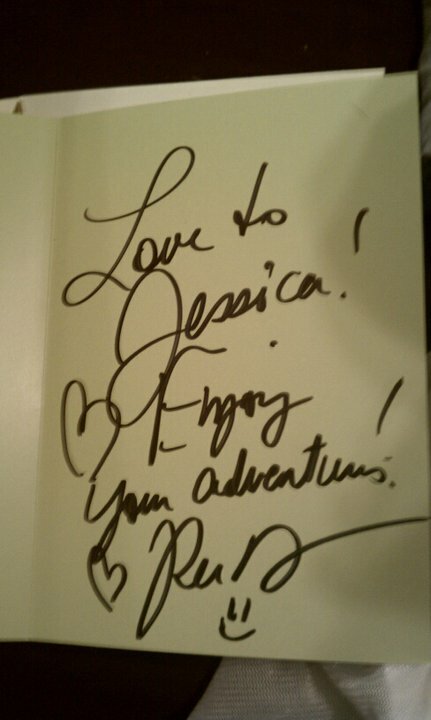 A good friend of mine got me an autographed cookbook for my birthday a few years ago. Of course this was before PW made it big. Back then my favorite was Ina Garten. Ok, scratch that. She is still my favorite. And that cookbook along with another Ina one that my Secret Sister got me are still precious favorites! Glad you had fun today! I missed you! so fun!! Looks like you have had lots of good things going on in your life! YAY for the Husband coming home! And who knew you were so talented??! !